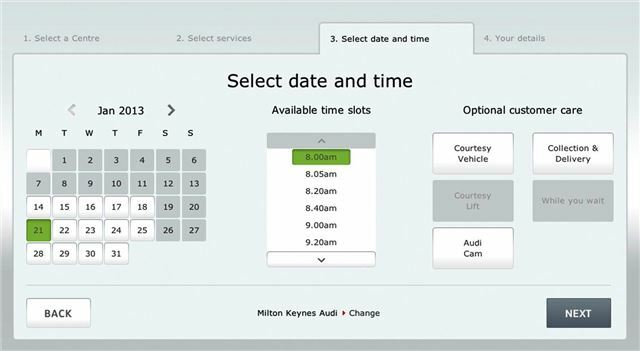 Audi has launched a new online system for booking maintenance, servicing, MoT and health checks online in real time, with an almost immediate confirmation response. The system means owners don’t need to drop into the dealership or call a busy phone line to book, because the system is active day and night, seven days a week. Owners who want to use the system will find it on the Audi UK website – it’s neatly laid out and easy to navigate. Owners can also book courtesy cars, car collections and deliveries, or lifts to and from the dealership. The option to watch remotely via webcam as the car is worked on is available, too. Booking is simple – owners select a location, then the service required. Available times and dates are shown on screen and when the owner has decided on the best time it’s blocked out on the system. An estimate is displayed on screen and then the price is confirmed by text or email. John Bower, Head of Service and Parts Operations at Audi UK, welcomed the new initiative: "The convenience factor is crucial to the continued success of our Audi Centres, so I'm delighted that this new booking facility is going to genuinely save our customers time and effort.